The aims of this study were to assess the effect of perioperative dexamethasone on postoperative thyroid surgery recovery using measures of wound drainage volume and C-reactive protein (CRP) levels and leukocyte counts. From January to September 2014, healthy patients, aged between 18 and 65 years, had elective thyroid surgery in the tertiary hospital. Eligible patients were randomized into either group D (dexamethasone 0.1 mg/kg IV) or group S (saline IV) after anesthesia induction. At the end of surgery, a drainage tube was placed at the thyroid bed with a negative pressure ball connected outside the wound. Drainage fluids were collected after thyroid surgery. The fluid volume and the levels of C-reactive protein and leukocyte counts inside were analyzed. All patients were followed up for 1 month. The median total drainage in group D (n = 103) was 43 ml (IQR: 21–83 ml), and 68 ml (IQR: 35–104 ml) in group S (n = 111), P = 0.002. More patients in group D were discharged on postoperative day 2 (74.8% vs. 54.1%, P = 0.002). The CRP levels and leukocyte counts were much less in group D than in group S (P = 0.002 and P < 0.001, respectively). Two patients (one in each group) had wound infections 1 week after surgery that healed one additional week later. 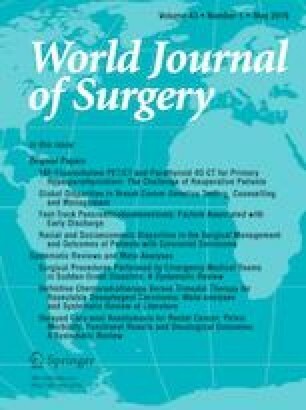 One perioperative small dose of dexamethasone reduced wound drainage volume and inflammatory content after thyroid surgery, thereby possibly contributing to early recovery. The effects of dexamethasone have never been evaluated before under these conditions. The online version of this article ( https://doi.org/10.1007/s00268-019-04986-0) contains supplementary material, which is available to authorized users. We appreciated the help from Mr. Rudolph Weitz who did English language editing and proof reading for the manuscript. Study conception was given by QZ. Study design was done by all authors. Participant recruitment was done by BW, QW, JL, CX. Data collection was done by HZ, QZ. Data analysis was given by HZ, YF. The first draft and the final paper were written by QZ, HZ. This study was funded by National Natural Science Foundation of China, Grant No. 81771933. There is no conflict of interest in the manuscript. Statement of human rights was approved by Shanghai Jiaotong University affiliated Shanghai Sixth People’s Hospital ethics committee.